4/13 Cup of Coffee: Portland was the only affiliate to come away with a win on Tuesday, knocking off Trenton in 10 innings. Salem fell despite a 12-hit effort, leaving 12 men on base. Greenville was unable to capitalize on a ninth-inning rally, and Pawtucket dropped its third straight. Little went right for the PawSox, who dropped their second straight to the Yankees' Triple-A affiliate. Starter Roenis Elias struggled in his 2016 debut, allowing five runs (two earned) in 3 2/3 innings. He walked four and struck out four. Robby Scott didn't fare much better, giving up three runs on three hits in his 2 1/3 innings. Pat Light managed to slow the onslaught, striking out three and walking one in two scoreless innings. It was a tough night at the plate as well. Pawtucket batters mustered only four hits off of a trio of RailRiders hurlers. Josh Rutledge had the only extra-base hit with his first-inning double, and he scored Pawtucket's only run on Sam Travis's single. Christian Vazquez worked three walks while seeing 30 pitches and has now reached base in 13 of his first 20 plate appearances, good for a .650 on-base percentage. The rehabbing backstop has drawn seven walks in five games. Things went much better for the other Boston affiliate taking on its New York counterpart. A bases-loaded double off the bat of Tim Roberson with two outs in the 10th inning broke a 3-3 tie, giving the Sea Dogs the victory. Roberson also had a single and a walk. Catcher Jake Romanski had a double, single, walk, and scored a pair of runs. Tzu-Wei Lin was on base three times with a walk and a pair of singles. Aaron Wilkerson turned in another solid outing, allowing a run on two hits in five innings while striking out six and walking only one. Simon Mercedes struck out four in his two innings of work, but also surrendered a two-run homer to Dante Bichette (NYY) that knotted the game, 3-3, in the seventh. Chandler Shepherd struck out three in his two perfect innings of relief to earn the win. Veteran Mitch Atkins struck out the side in the 10th to earn his first save since April 2010, when he was a member of the Iowa Cubs. Salem took the loss despite more strong individual performances at the plate. Andrew Benintendi and Yoan Moncada (pictured, above right) each recorded two more hits. It is early, but High-A ball is providing little resistance for the highly touted duo. Benintendi also doubled and stole his first base of the year, while Moncada continues to run at every opportunity. He stole two bases to give him six thefts on the year, and was also caught trying swipe a third. 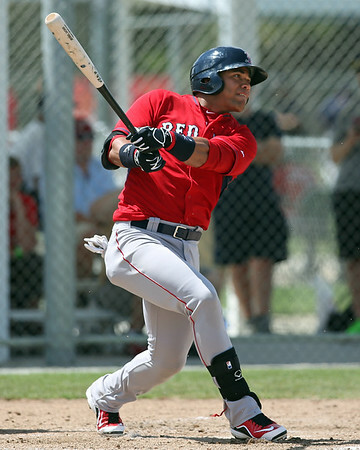 Forgotten some amongst the hot starts by his fellow top prospects, Rafael Devers ripped his third double of the early season and worked a walk. The strongest night belonged to right fielder Danny Mars (pictured, left). The 2014 sixth-round pick stole three bases while going 2 for 3 with two walks, a run scored, and an RBI. Big left-hander Dedgar Jimenez, the third-youngest pitcher in the Carolina League, made his 2016 debut with mixed results. He needed 73 pitches to get through four innings, but was not hit especially hard, allowing two runs on four hits while striking out three and issuing one walk. Jamie Callahan took the loss in relief, allowing three runs on five hits in three innings. He also walked three and uncorked a wild pitch. Austin Maddox threw two frames, allowing a run on three hits. It was a long night for the Greenville lineup, which didn't record a base hit until Mitchell Gunsolus singled in the sixth -- and he was immediately erased trying to stretch it into a double. After failing to get a baserunner to second in the first eight innings, the Drive showed life in the ninth. Michael Chavis and Josh Ockimey recorded back-to-back singles with one out. After an Austin Rei strikeout, Joseph Monge walked to load the bases. With the tying run on second base, West Virginia was able to induce a ground ball by Kyri Washington that forced Monge at second and close out the game. The highlight of the evening was the strong effort by starting pitcher Matt Kent. The southpaw out of Texas A&M tossed six shutout innings, allowing four hits and striking out two against two walks. Victor Diaz took the loss in relief, giving up a pair of runs in two innings. Diaz has the misfortune of being charged with the loss in both of the Drive's defeats this year. Jeffry Fernandez recorded a scoreless ninth to keep Greenville within two runs.